Well, I almost made it a whole week without wearing my skinny jeans- but when it comes down to it- they are one of my favorites- so why fight it?! The funny thing about this outfit is that I was actually planning on wearing this skirt on the right. But upon trying it on (especially paired with this belted cardigan), I realized that this look is NOT FLATTERING, and in fact very matronly and dated. Oh that can’t be! I love this skirt and still remember when I bought it at Nordstoms. When in doubt, take a picture of yourself in a questionable item- the camera doesn’t lie! So, that being said, I decided to go back to my ever favorite, ever comfy skinnies. 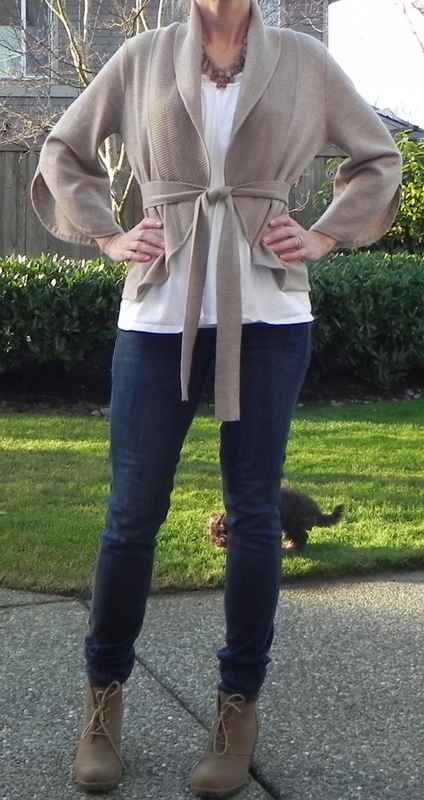 This outfit works better because of the balance of the loose, flowy cardigan on top and skinny jeans on bottom. With the skirt- there is too much volume on both my top and on bottom- hence the matronly, frumpy look. Per a suggestion from yesterday’s shoe dilemma, I’m wearing my new favorite shoes- the desert bootie. I think these might just be the shoe for me. I like the wedge heel (so much more comfy than a regular high heel), the color is neutral so it goes with anything) and it’s a great alternative to knee high boots. What is your ‘go to’ shoe of the season? The long white tank works well with this cardigan. I’ve linked up to Fashion Friday, check it out for great ideas! Wow, what a difference. I’ve always steered clear of “skinny” pants thinking they wouldn’t fit me very well, but I just purchased a pair to wear with knee-high boots and a sweater dress and love it. In recent years I’ve been feeling very matronly/frumpy – I may try the style you listed here for a little everyday pizazz! Thanks! I used to feel the same way, thinking I am not skinny enough for skinny pants- but then I got over that. As long as you wear something bigger on top (something a bit loose, oversize, or flowy) your bottom will look skinny in comparison. It’s a great ‘everyday’ look! Thanks for the tip about the boots! I was so excited to have another option, thanks for your comment! I actually went to DSW and found a pair in black as well (Mia brand), so now I am totally set! I’ll check out Khol’s for the boot covers and the midcalf lace boots! Thanks for another great suggestion! Yes, that is my puppy doing her thing in the background- isn’t that hilarious!! I had NO IDEA!! The jeans look SOO much better!!! That skirt does look a little frump with the bulky sweater – but would look fabulous is spring with a white cami, a bright cardigan and maybe a skinny red belt? Good point- I’ll keep the skirt and try it this summer with a slimmer look. Now all I need is a red skinny belt! Great idea, thanks for your suggestion! love your outfit – perfect for most days in my life! I need to find your shoes – i am thinking that they are a winter staple here in the NW! Thanks! I got these at Khol’s, but I would recommend going to DSW, they have them in more colors (including black which I just got) and they are more comfy. The brand I bought was Mia. Good luck and thanks for commenting! I love your outfit! I think I’m going to have to buy a pair of those shoes!! I don’t think I could make it a whole week without wearing my skinny jeans! You look great! Looking good! Good call changing to the skinny jeans. It’s kinda hard to go wrong with them, isn’t it? One of my go-tos this season is a plaid shirt with a grandpa sweater/cardigan, skinny jeans, and boots. I’ve been trying to wear skinny jeans less, too. It’s not easy! Sounds like a cute look, I will try that! I’ve been trying to wear plaid for a while now!